A larger Incan Caullama Stone Conopa in the form of a heavy fleeced Suri Alpaca. Shows 4 folds of hair falling from the neck. Hair over eyes with open mouth. Toroidal shaped qocha (reservoir) ground into back. Passed down in generations from father to the eldest son. Used in ceremonies to increase their herd. According to Spanish chronicles, black alpacas were made as offerings on special ceremonies. Made from Andesite stone. Typical Conopas are generally less than 5” in length. 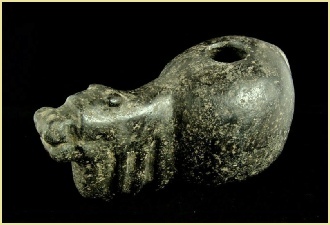 This effigy figurine is massive in comparison and in Choice condition. Measure 7.25" (18.41cm) in length. is smaller than the inside with inner walls being smooth. A very time consuming process.